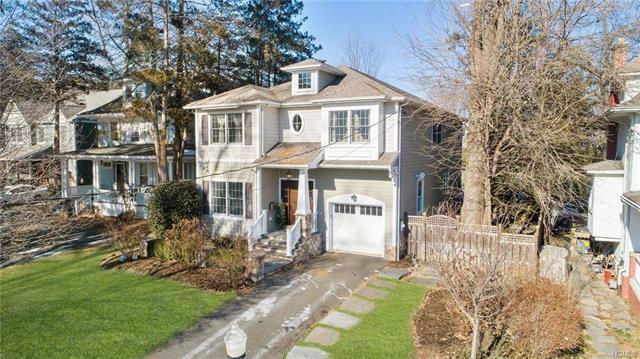 Searching for that quintessential gracious home nestled in the Village of Nyack just steps to downtown and the Hudson River waterfront? This young colonial is the one for you! Picture perfect in every respect, the 9 ft ceilings and open floor plan invites gatherings. Enjoy the magnificence of the light & airy rooms including expansive gourmet kitchen with huge center Island that is the hub of this home. Custom cabinetry, Granite counters, GE Chefs appliances, & regal breakfast area open to formal Dining room and generous Family Room with Fireplace and sliders to a magnificent back oasis. Relax outside on the immense paver patio with built in Fireplace, charming masonry walls & abundant flowering specimens. Other features include Hardwood floors, surround sound, built in speakers, river views. Retire in the luxurious Master Bedroom suite with tray ceiling, whirlpool bath & walk in closet. The easily finished lower level has extra high ceilings. Fantastic location and elegance combined!